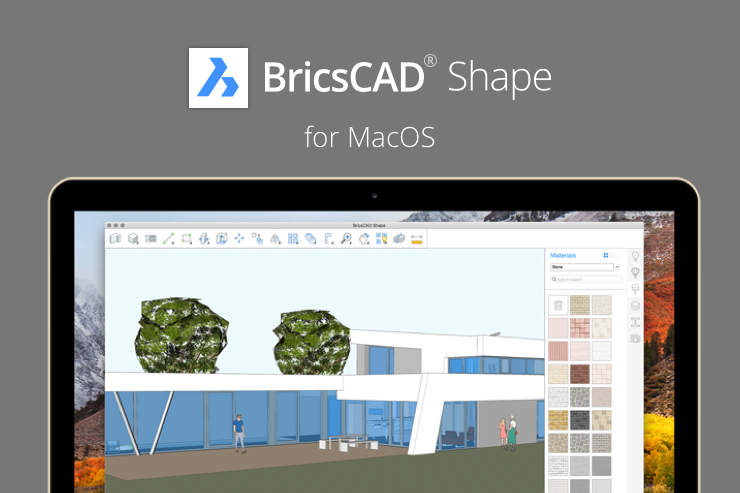 We are happy to announce the availability of BricsCADⓇ Shape for macOS. The best solid-based schematic modeler is here for your Mac, and it’s free. Download it here. BricsCAD Shape is our conceptual modeler for architects, designers and engineers. It speeds and streamlines 3D schematic design capture, using CAD-accurate solids. BricsCAD Shape is free of charge to everyone, with no commercial usage restrictions. Why BricsCAD Shape for macOS? BricsCAD Shape is the start of the Bricsys path to Building Information Modeling (BIM). BricsCAD Shape for macOS brings the power of solid-based schematic design to architecture’s favorite computer. Shape uses solids to create real 3D models. It is fully CAD-accurate, and it gives you the freedom to design, then change deeply, radically, repeatedly – over and over. BricsCAD Shape lets you create freely, without limits. Underneath the simple user interface of Shape is the fast, proven, parametric 3D direct modeling engine that is found in BricsCAD. BricsCAD Shape stores your designs in industry-standard DWG files – just like BricsCAD and BricsCADⓇ BIM. You now have a fast, elegant conceptual design tool that is 100% inside your BIM workflow. There is never a need to start your BIM from scratch after concept design approval. Simply open your Shape model in BricsCAD BIM, and in minutes you’ll be weeks ahead of your competition. The Bricsys BIM workflow starts in Real 3D with BricsCAD Shape. It stays in 3D throughout the process, with your data stored in industry-standard 2018 DWG. Add intelligence to your BIM, then speed the creation of 2D construction documentation with the world’s best drafting tools. There are no breaks or rework in the BricsCAD BIM workflow. Never start over from scratch after design approval. Your concept design becomes your BIM. It’s that simple. Get to BIM faster, start in Real 3D – download BricsCAD Shape today. It’s available for macOS and Windows – Linux version coming soon! Hi Trent, you can download the Windows version of Shape from the same web page. Just select “Windows” from the list box. Just to confirm, as long as they do not run concurrently, are you allowed to install Shape on both a work Mac desktop and a mobile Windows laptop under the same single user license, as you can with BricsCAD Pro? I have spent even longer in the .dwg environment starting with acad2. Have been using Bricscad since pre 2000. Shape is fabulous software and the fact that it’s freeis even more amazing, congratulations on doing this. I have briefly checked out Shape & love the fact that this is free but found the lack of custom toolbars frustrating. Where are the preferences and options? One would have thought a walk through feature associated with the camera would be essential ??? A bit too much like sketchup and Mac based programs in that there is no right button functionality for users of real computers! I much prefer to use Bricscad with full functionality. Thanks for the opportunity to have my say. Is there a manual for Shape? congratulations for Shape arriving to Mac OS! In the last days I’m trying out this simple and efficient software and it is doing ok for architecture design… Nevertheless I would like to know how to export just the section of a building to another CAD software? As mentioned higher Shape uses dwg, so “other” CAD software should be able to read the dwg saved in Shape.